In the wilderness areas and game reserves you spend time in during your programme antelope sightings will be a regular and there will be plenty of time to observe their behaviour. 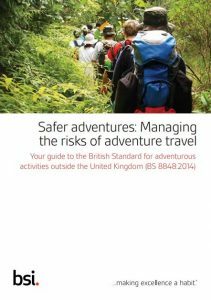 Below you will find information on some of the antelope species you may encounter during your programme in Africa as well as links to other sites such as Wikipedia, AWF, WWF for more information should you require it. The Nyala is a dense forest/ thick bush antelope, uncomfortable in open spaces and is most often seen at water holes. Nyala live alone or in small family groups of up to 10 individuals. In the female the brown shaggy coat is marked with white vertical stripes and spots on the flanks. Rams appear more charcoal grey in color. The rams have long inward curved horns (approx. 650mm) and a white chevron face. They have a ridge of long hairs along the under parts, from behind the chin to between the hind legs, they also have a mane of thick, black hair from the head along the spine to the rump. This antelope feeds by both grazing and browsing and will readily feed on leaves, fruit and flowers. This variety in their diet is one of the factors ensuring their successful survival. 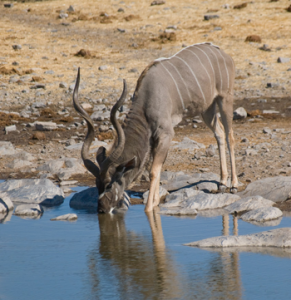 This large antelope inhabits dense woodlands and thickets along permanent water. It is very secretive and more easily seen at night. 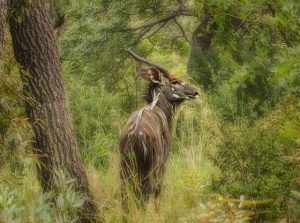 Nyala are not territorial, but both sexes have overlapping home ranges. The short, smooth coat varies in general colour from tan-grey to bluish-grey in colour. There are 6-10 vertical stripes along the sides, a chevron between the eyes, and cheek spots. On the neck and shoulders is an crest and underneath a mane extends along the throat. The ears of the greater kudu are large and round. The spiralled horns are found only in males and have up to 3 full turns. They can grow 100-140 cm / 40-56 inches long. When running through the bush the head is raised and the horns are laid onto the back. The large ears are extremely sensitive to noise, making these shy antelope difficult to approach. 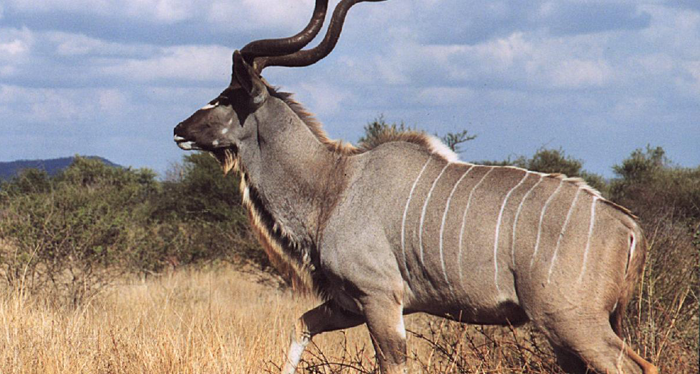 Under normal circumstance, kudu will sneak away and hide from potential enemies. When startled they flee with large jumps with their tails rolled upwards and forwards. Kudu often stop and look back after a running for a short distance – a frequently fatal habit. Despite their large size, kudu are accomplished jumpers, with records of heights of over 2.5 meters. Home ranges of adult males are about 11 square kilometers, and generally encompass the ranges of two or three female groups. 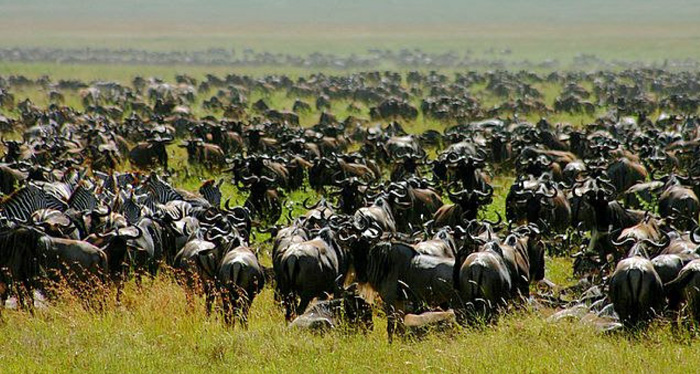 Populations vary from 2-3 animals per square kilometer. The spiral horns are so well developed for wrestling that they can sometimes become so severely interlocked that the two animals fighting cannot release each other, and thus both die. 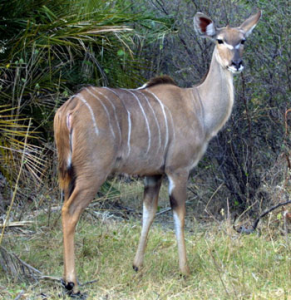 Greater kudu have a wide repertoire of vocalizations, including barks, grunts, hooting bleats, and a whimper. The Blue Wilderbeest is a large antelope which is to be found in the open plains, bushveld and dry woodlands of Southern and Eastern Africa. They can live for more than twenty years, particularly those that have the protection of a large herd. 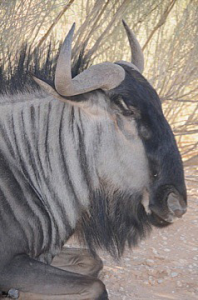 The Blue Wildebeest (also known as a Brindled Gnu) differs from the Black Wildebeest in both distribution and appearance. 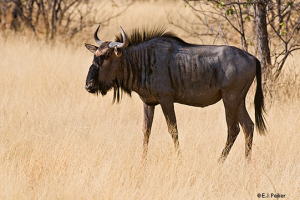 The Black Wildebeest is only found in a small area in South Africa and is easily distinguishable by its white tail (giving it the alternative name of White Tailed Gnu). The Blues can be blue-grey or grey-brown in colour and they have manes, throat hairs and beards. They have vertical bands of dark brown hair on their bodies, which makes them look wrinkled. The males are quite territorial, marking out their boundaries with heaps of dung, secretions from glands and by pawing the ground. They show their aggression by snorting loudly. Blue Wildebeest must always be on the look out for their predators: lions, cheetah, hyenas and wild dogs. The graceful impala is a slender, medium-sized antelope so adaptable that it is found from southern Africa to the northern limits of East Africa. 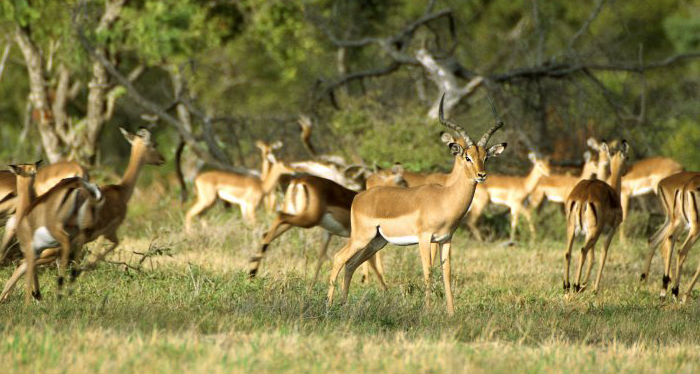 Impalas are found at grassland and woodland edges, usually very close by water. 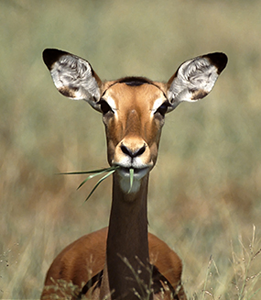 Impalas eat tender young grass shoots in the wet season and herbs and shrubs at other times. During the dry season they must drink daily. 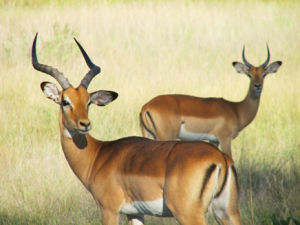 Impala are very adaptable and when food is plentiful, the males become territorial. Their range averages 3 square miles and six to eight dominant males set up territories. 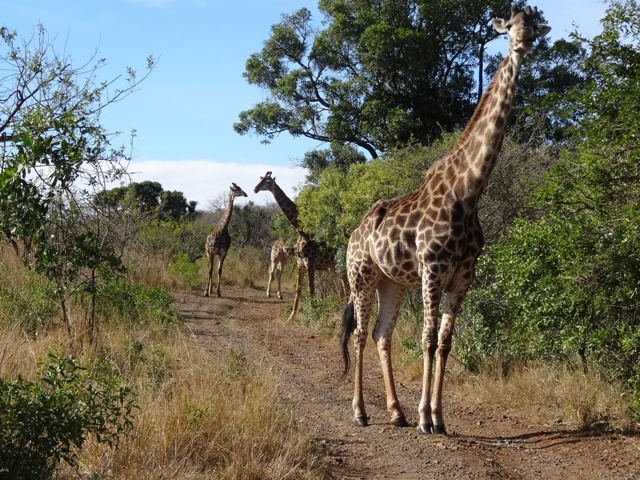 Males stand with erect posture, rub scent from face glands and make dung heaps to mark their territory. Males are quickly identified as they have horns, whilst females do not. The young are suckled for 4 to 6 months and grow rapidly, reaching maturity at a little over a year. The young males, however, are evicted from their mothers’ groups when they are 6 months old, staying around the edges of the herd until they join a bachelor group. During this transition period they are most vulnerable to predators. The young are killed by jackals and the smaller cats, baboons, eagles and pythons. When in danger, impalas will “explode” in a magnificent spectacle of leaping. In their zig-zag leaps, they often jump over and across their companions, probably to confuse predators. They perform a high kick of the hind legs, a movement thought to release scent from the glands on the heels, making it easier for them to stay together or to confuse the predator.